If you’re anything like me, you live in the north somewhere where it snows and it’s cold, and your hands have taken a beating by this time in February: cracked, sandpapery, and painful. I love Neutrogena Norwegian Formula hand cream, but unless I put it on in microscopic bits, it’s very greasy, which makes me not want to put it on, which makes the skin on my hands suffer even more. My husband came up with an excellent tip to use this lotion. My hands are irritated but his have taken a much more brutal beating this winter. He’s a plumber and has cracks on his thumbs and finger joints that are deep and bleed. Below is his method. I have personally tried it, and testify that it works. 1. Dampen your hands slightly with water. I know, this is probably the last thing you want to do when your skin is so dry, but it works. Do not run them under running water, just put a few drops in your palm and run your hands together so the palms and the backs are moistened, not soaked. 2. 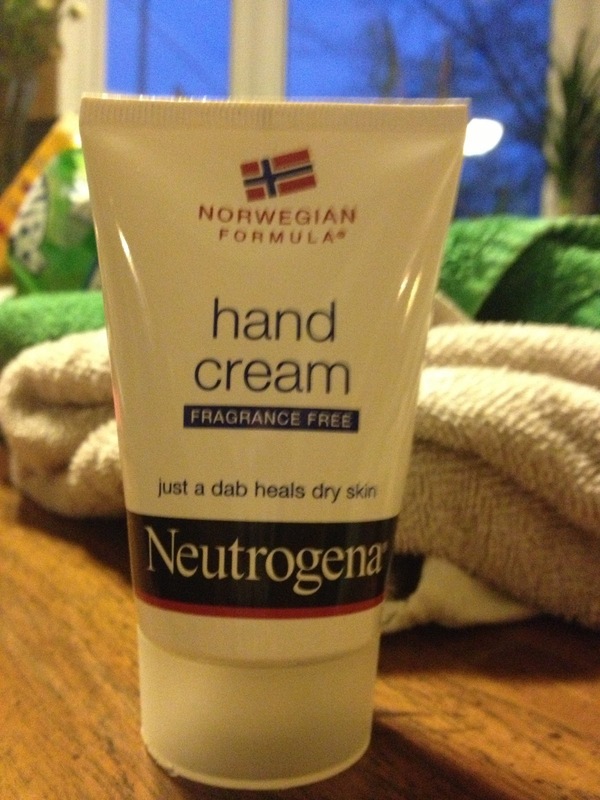 Apply the Neutorgena Norwegian Formula hand cream. Rub it all over your hands, into your fingers, in the spots you need relief the most (for me it’s the knuckles on my index fingers). The lotion should lather like soap. If you have time, let it sit on your skin for a few minutes (soooo soothing!!). 3. Take a paper towel and gently wipe the cream off your hands. The result is smoother, softer skin that’s not greasy, and you can immediately carry on. It’s amazing! So glad my husband told me and so I wanted to share it with you.